Take a trip back in time and discover the mysterious beginnings of the Crescent City! Embrace the rich culture of the "Big Easy" ind uncover the French Creole - The Cajuns - Mardi Gras and Carnival - Pirates - Casket Girls and Prostitutes & the Mob in New Orleans! Continue your journey through the darkest history of the city. Guests will be allowed to stop and grab to go drinks along the tour route! Enjoy a tour where learning is intoxicating. The name of “New Orleans” conjures up a succulent variety of images, from the soft sounds of jazz to whirring ceiling fans, wrought iron gates, and hot, spicy food. Along the swollen Mississippi River, the city dozes, only to come alive at night with the revelry of its people and the blare of music and laughter from Bourbon Street and the French Quarter. These are the images of New Orleans that many people think of... but there is another side to the city as well, an underbelly and a darkness that is as carefully hidden as the gates to the small gardens which lurk between buildings in the Quarter. This dark side is there, just like the spectacular gardens and courtyards, but you have to know where to look for it. Even if you don’t see it, it’s liable to sneak out at you and surprise you when you least expect it. The dark side of New Orleans is as compelling as the chicory-laced coffee and the delicious “beignets” however.... it’s a dark side which is filled with the seductive images of voodoo, vampires and ghosts. Only in New Orleans could darkness and death seem so appealing! But to truly understand the hauntings of a city, we must first explore its history. What events took place to cause the location to become so haunted? 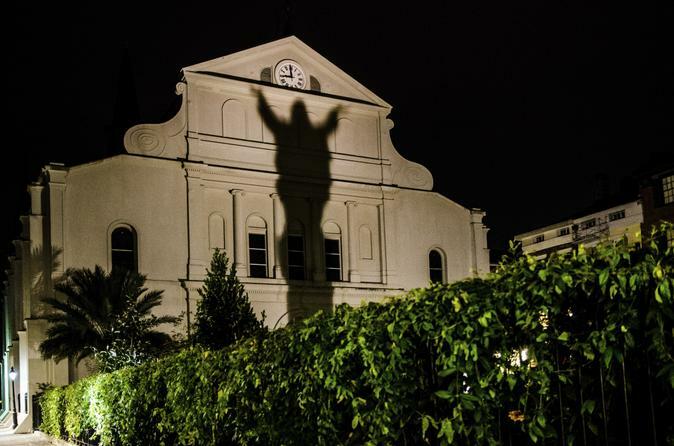 Why did so many ghosts lurk in New Orleans? To understand this, we must take a strange and wonderful journey into New Orleans' past... Then, prepare yourself for a dark journey into one of the most haunted cities in America! Join this tour...if you dare!! !